This unique Padilla Stoneware personal tea set would make a great gift. 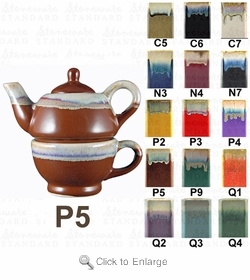 Who wouldn't enjoy having their very own individual stoneware personal teapot and stoneware cup? It comes in 15 different colors. Approximate dimensions (l x w x h): 5" x 5.75" x 7.5"